In a matter of decades, political and scientific debates concerning the environment have generally moved from the margins to the center of public life. But our collective understanding of what constitutes “the environment” has changed significantly during that same period. The notion of “the environment” has a specific and, in many ways, surprising history-despite the fact that it is a fairly recent conceptual invention. Bennington College Professor and New School for Social Research anthropology PhD alumnus David Bond studies this history of our present. Straddling the lines between anthropology, climate science, and critical theory, Bond's work helps unpack not only what we know about the environment, but also how we came to know the environment. In this context, he pays particular attention to the role that environmental disasters bring the environment to the center of public debate. Troubled by the injustice and racism he saw in the world, and moved by the desire to do something about it, Bond initially went to college to study sociology. He thought that sociology would be the best lens through which to grapple with the issues that motivated him. Bond was still on that path when he arrived at the New School for Social Research as a master's student in sociology. Surprisingly, it was a course taught by Willy Brandt Distinguished Professor of Anthropology Ann Stoler that most marked his experience. Bond has just published a paper in the journal Comparative Studies in Society and History concerning how the US empire of oil offshored crucial hydrocarbon infrastructure to the Caribbean to avoid rising labor and environmental concerns, and the unexpected role those leaky refineries had in bringing new attention to the ecology of mangroves. . 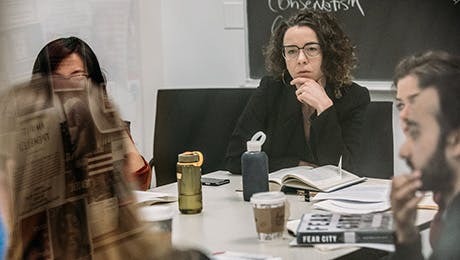 In January, Bond also organized and edited an online forum at Cultural Anthropology, providing a space for anthropologists to respond to the rise of Trumpism “as a political present” in the United States and its implications for critical theory. He is expanding his introduction to the forum into a full-length essay while finishing a book manuscript based on his New School dissertation, which tracked the emergence of the category of “the environment” during the BP spill of 2010. Pivoting to his current work, Bond described his collaboration with University of Oklahoma Assistant Professor of Anthropology Lucas Bessire and University of Alaska Fairbanks Assistant Research Professor Stacy Rasmus. The trio was recently awarded a $1.1 million grant from the National Science Foundation to conduct a new multi-year community-driven study on the “ends of oil” in Alaska. “Contemporary Alaska becomes a really interesting and consequential place to ask questions of how oil ends,” Bond said, pointing to the fact that Alaska has long been subsidized by oil revenues, but at this point the oil reserves are running out. He elaborated, “It is unclear how the ways communities have organized themselves will survive without those revenues. At the same time the environmental fallout from that oil is having an outsized impact on the far north, where permafrost is melting and the coasts are eroding.” Many rural communities are thus caught in a pincer, between increasing ill effects and dwindling support. For many, the Alaskan far north might feel removed, but in this specific case, Bond suggested we might find an image of humanity's future. What went wrong? What enabled the wearing away of this category's political bite? Reflecting on the particularity of his methodological approach, Bond cited The New School for Social Research, where learned “to ask what advances the interests of the state, capitalism, or empire.” He cautioned that this is not to say that only one of these interests is effective in any case, but that asking this sort of questions allows for insights into our present, whatever the specific concern may be. Bond illustrated the point: “In the BP research, the state was the main actor, in the recent paper on mangroves in the Caribbean, empire was the key register.” For Bond, these three registers most usefully direct critique.